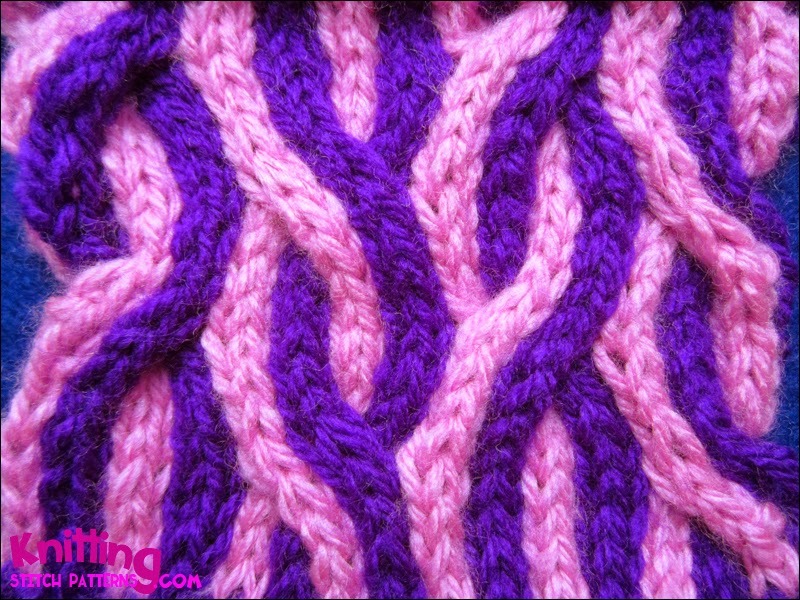 This corkscrew cable pattern is an 8 row repeat and is knitted in a multiple of 16 sts. It looks lovely on the right side, but its back is a bit ugly. Cable 8 Back: C8B – slip 4 stitches to cable needle and hold in back. From left hand needle, k2 in main color (MC), k2 in contrasting color (CC). From cable needle, k2 in MC, k2 in CC. Cable 8 Front: C8F – slip 4 stitches to cable needle and hold in front. From left hand needle, k2 in MC, k2 in CC. From cable needle, k2 in MC, k2 in CC. Row 1: * P2 in CC, p2 in MC; repeat from * to end. Row 2: * K2 in MC, k2 in MC; repeat from * to end. Row 4: * C8F, k2 in MC, k2 in CC, k2 in MC, k2 in CC; repeat from * to end of round. Row 7: Rep row 1. Row 8: * K2 in MC, k2 in CC, k2 in MC, k2 in CC, C8B; repeat from * to end of round.